A ban on blank sheets of paper is expected soon, too, because paper can be used to draw racist images as well. "Walmart does not wish to give tools to children that might be used to create offensive representations of inappropriate ideas," touted a Walmart spokesperson. "Leading retailers including Walmart (WMT), Amazon (AMZN), Sears (SHLD) and eBay (EBAY) have now said they'll stop selling Confederate flag merchandise," reports Yahoo News. "EBay announced its ban on Confederate flag sales a short while after that, saying 'we believe it has become a contemporary symbol of divisiveness and racism.' Amazon didn't respond for this article, but it announced its own ban about two hours after eBay did." This "mad rush" to total thought conformity exemplifies to absolute panic exhibited by spineless corporations whose executives tremble with the fear over the thought of not instantly falling in line with whatever socially-pressured craze is sweeping the nation at the moment. They're practically stampeding over themselves to see who can ban more Confederate merchandise the quickest. Now the people who want to burn the Confederate flag can't even find them for sale! As you might expect, there's a massive supply and demand problem being created by this mad rush toward absolute social obedience and conformity. With the announcement of the "National Burn the Confederate Flag Day" on Facebook, all the people who are desperately trying to BUY the Confederate flag so they can BURN the flag are discovering their free speech is being suppressed because companies won't sell them the flags. Dang it, man! How am I supposed to burn this flag if no one will sell it to me? So now Walmart, Sears, Amazon and other companies are suppressing the free speech of the obedient activists who want to show how incredibly "appropriate" they are by burning the Confederate flag on Youtube. If only they could find such flags in the first place, they could accomplish this amazing feat of heroism. Because lighting up a piece of cloth takes real balls, you see. And so all these people, it turns out, are having to draw their own Confederate flags, which of course makes them outright racists and bigots. After all, who would draw the Confederate flag other than an obvious racist hater psycho? To draw these flags, people are rushing out to Walmart to purchase crayons and magic markers, especially in the colors of red, white and blue -- the very colors used in the Confederate flag as well as the United States flag, which will no doubt be next on the list of flags to burn. Thus, Walmart has come to realize that people are visiting its stores and buying red, white and blue magic markers to draw "unfortunate symbols of hate" which the Walmart corporation can never allow to happen, because that might invite vicious waves of robot-automated attacks on Twitter, which Walmart executives mistakenly think are tweeted by real people. So as of today, less than two weeks away from July 4th, Independence Day, Walmart will be banning the sales of all red, white and blue crayons and magic markers. 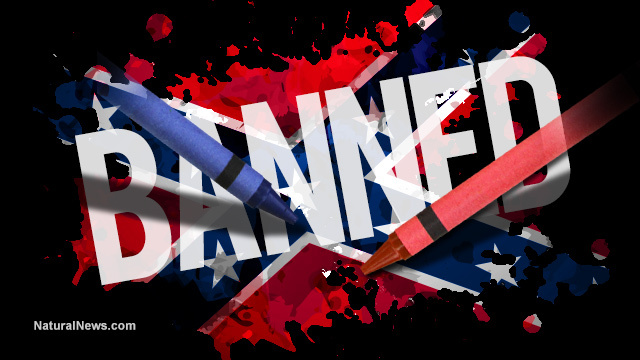 Bans on blank sheets of paper will be next, followed by a nationwide ban on the very colors currently known as "red" and "blue," both of which will be reassigned via trans-coloration to the more politically correct names of "Earth rust" and "climate sky." Thought police will be standing by at Walmart with further instructions that prohibit items you've purchased at Walmart from being used in any way whatsoever that anyone anywhere in the world might, for their own reasons, find anywhere close to offensive. How comforting to know that Walmart is now protecting me from my own irrational purchasing behavior. Notably, Walmart is happy to continue selling infant formula made primary with high fructose corn syrup. Apparently, that's perfectly "appropriate" for America.